Tonight is the premier episode for “A Very Barry Branson” the third reality TV show to originate here in Branson, Missouri. This show follows “Game of Pawns” on the Discovery Channel and “Branson Famous” on TruTV. The show will be on the GAC TV channel at 8 PM Central Time. To be honest I would rather be out on Table Rock Lake than spend my time watching Reality TV. But “A Very Barry Branson” promises to be different than the typical Reality fare. Barry Williams aka Greg Brady from the “Brady Bunch” is seen regularly around Branson and out on his Boat on Table Rock Lake. He has become friends with The Haygoods, established Branson entertainers. They are fully immersed into the Branson Area Lifestyle and this show promises to highlight the Tri-Lakes region, not just the Branson shows. The positive publicity from this show will show another side of the Branson area that is unknown to people that have not been here. It was great to see Mr. Williams on the Today Show. This is also been highlighted in numerous new outlets. It has been a while since Branson has received this kind of recognition. Rock Lane Marina will be flying the “Missouri Clean Marina” Flag in support of keeping Table Rock Lake Clean. The Missouri Clean Marina program is a voluntary plan that encourages marinas to keep oil, gasoline and runoff pollution from reaching Table Rock Lake. The program also aims to educate recreational boaters about practices they can adopt to keep pollution such as fuel spills and leaking engine oil from getting into the lake. This program, administered by Ozarks Water Watch and the Missouri Stream Team Watershed Coalition, is piloted on Table Rock Lake and hopefully will be expanded throughout Missouri. The program recognizes marinas with an official designated status for being good stewards of the environment and taking steps to protect water quality. Ronna Haxby, projects manager with Ozarks Water Watch, congratulated the staff for qualifying the marina for designation. Rock Lane Marina has incorporated environmental Best Management Practices and completed an Emergency Response Plan. They posted signage encouraging safe environmental practices, promote recycling, and have implemented environmentally friendly policies. Haxby presented the “Clean Marina Designation” certificates, a flag with the Clean Marina logo, and signage for docks and rental boats. The 2014 Season is off to a great start with Spring Break. The NAIA College Basketball championship, Worldfest at Silver Dollar City, FLW Bass tournament, numerous Branson Shows, and warmer weather have attracted many families. The Branson, Table Rock Lake area has become a Spring Break Destination due to our family friendly, multi-generational environment. With the warmer weather the docks are busy getting the boats ready for the coming season and going for their maiden voyages of the season. While Rock Lane Resort and Marina is just minutes away from the Branson Strip, the tranquil atmosphere makes you feel that you are far away from the hustle and bustle of the city. It’s amazing what a difference a week makes. 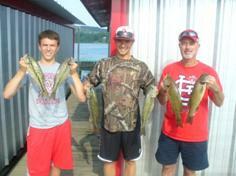 With the second holiday upon us, Table Rock Lake Fishing is still very good. The top water bite has fallen off but the deep bite is going strong. First thing in the morning you can still catch a few on top as well as catch some good Smallmouth Bass around the pea gravel points and flats. Once the sun gets up high you need to drop down deeper and fish the drop shot rig for Kentucky Spotted Bass. You’ll want to throw a jointed Redfin or Zara Spook for the top water and a tube or jig for the Smallmouth. We’ve been drop shotting night crawlers for the Kentucky’s but a small 4 inch finesse worm will work also. The White Bass have stopped schooling on top as the shad have retreated to deeper water as the water Temperature has warmed into the 80s. The best way to find them is to troll around watching your locator looking for the schools of shad and fish. There is a lot of boat traffic on the lake so get out early to avoid the crowds. If your interested in a guided fishing trip I do have a few openings so give me a call and we’ll set up a time to go. Table Rock Lake Fishing is on. 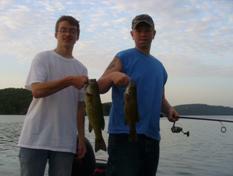 With the holiday weekend upon us, Table Rock Lake Fishing is very good. The water temperature is hanging around 70 degrees and the lake level is up a foot and a half. We have a full moon approaching and another wave of spawning fish have moved up. This wave of spawners is not as big as the last but I have noticed more Smallmouth Bass on nests than Largemouth or Kentuckies. Fish can be caught on just about anything you like to throw as long as the conditions warrant. If you have wind a lot of the power baits will produce but if it’s sunny and calm you have to downsize and work a little deeper unless you are targeting the spawners. This week we have caught fish on topwater baits, crankbaits, shakey heads, carolina rigs, jigs and spinnerbaits. The White Bass have even showed for the holiday weekend. They can show up anytime and anywhere. We have caught them on topwater when they surface and with white grubs when they are down. We have seen them in mainlake pockets, points and out in the middle so have something ready because you just never know when they will show up. As always on a holiday weekend, get out early because the boat traffic will chase you off the lake by noon. Everyone have a safe and fun weekend.